John, one of my subscribers, asked me a great question yesterday about how he could hit deeper groundstrokes. In my latest Newsletter, I discussed why doing so is critical to your success in tennis. John emailed me back and said that he has trouble hitting the ball deep. He can hit deep groundstrokes when he plays aggressively, but if once he gets tired or is pulled out wide, he hits shorter balls. He has also tried adding weights to his racquet, which hasn’t helped him very much. I emailed John back with three tips on how to hit deeper groundstrokes. And now I am going to share these tips with the rest of you. Thanks for your question John! Increasing the height of your shots is my favorite tip for hitting deeper balls. It also ensures that you have enough clearance to avoid hitting in the net. You need to hit higher balls with spin so that the ball comes back down into the court. Visualize the path of a rainbow, and try to hit your shots in that same path. If you hit higher, loopier groundstrokes, your shots will land deeper into the court and you will have less unforced errors. You don’t have to muscle the ball to hit deep. The more you keep your arms and muscles loose, the easier it will be to hit a deeper ball. 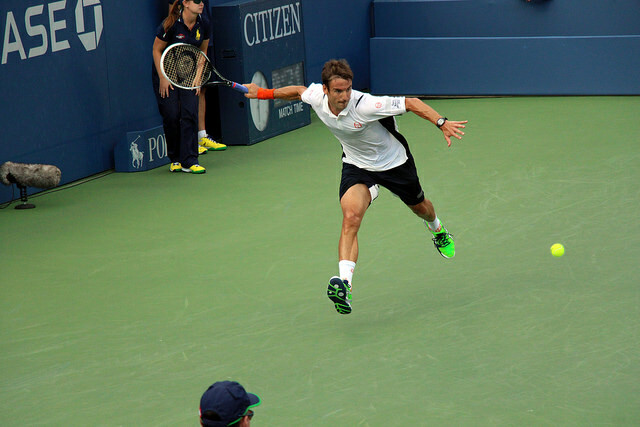 You have probably noticed that the pros appear to hit deep groundstrokes with little effort. This is because their strokes have become second nature, which results in loose and relaxed muscles. On the contrary, those of us who are trying to learn new strokes or implement new strategies often tense up our muscles because we are consciously trying to do something new and unfamiliar. As John pointed out, when you are tense you will get tired quicker and the result will be shorter groundstrokes. A more relaxed arm will result in deeper groundstrokes with less effort. Think of your body as one unit and use it to execute your stroke. Otherwise, you will end up “arming” the ball. Using your arm alone takes away all the potential power you could be using from your entire body. And it will also get you injured because of the extra stress that your arm has to endure. Utilize the hip and shoulder turn, legs, core, and arms. Use your entire body to help you hit deeper shots. (1) Tie a piece of string several feet above the net (or imagine it is there) and then force yourself to hit your shots above the string. This was a drill we did in college to help us hit deeper. (2) Get someone to feed you balls from a hopper. You must hit every ball past the service line. A successful shot is +1, hitting into the net is -3, hitting short is -1, and hitting out is 0. You have to get 20 points to finish the drill. Adjust the point scheme to your liking. I suggest hitting your shots crosscourt. I hope the above tips help you hit deeper groundstrokes. Try them out and let me know if they help. Do you have any other tips or drills for hitting deeper groundstrokes? Comment below!